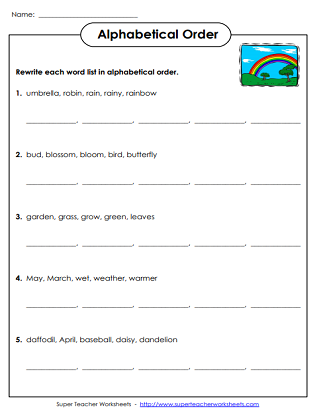 This page contains worksheets and activities for teaching students how to place words in alphabetical order. Includes word sorting cards, cut-and-glue activities, and worksheets. Use this alphabetical order generator tool to make a custom ABC order worksheet with your own word list. Cut out the words and glue them in ABC order. The first letter of each word is different. Categories include colors, numbers,and animals. Rewrite each word list in ABC order. Sample list includes: train, bus, car, ship. Rewrite the word list in ABC order. Sample word list includes run, jump, play, and sing. Sort the word cards in alphabetical order. Includes twelve cards with basic farm animal words. Arrange the words in alphabetical order on a table. Includes twelve cards with basic outer space words. Sort the word cards in ABC order. Includes twelve cards with bug/spider/insect words. Cut out the words and glue them in ABC order. Requires students look at 2nd and 3rd letter of each word. Categories include animals, fruits, and holidays. Write the word lists in alphabetical order. Requires students to look at the second or third letter of each word. Sample list includes: runner, race, rush, ran. Sort the word cards in alphabetical order. Includes fifteen animal word cards. Arrange the word cards in alphabetical order. Includes fifteen color word cards. Place the word cards in alphabetical order. Includes fifteen word cards with occupations on them. Recommended for grades 3 and up. Write the seven days of the week in alphabetical order. Then write the correct abbreviation for each word. Cut out the words, categorize them, alphabetize them, and glue them onto the worksheet. Categories include measurement words, country words, and ordinal numbers. Rewrite each word list in alphabetical order. Word lists require students to look several letters into each word. Sample list includes: rainbow, reindeer, raindrop, railroad, raincoat. Rewrite each word list in alphabetical order. Word list requires students to look several letters into each word. Sample list includes: four, fourth, fourteen, forty, fourteenth. Place the word cards in alphabetical order. Includes eighteen word cards. Cut out the word cards and arrange them in alphabetical order. Set includes eighteen cards. 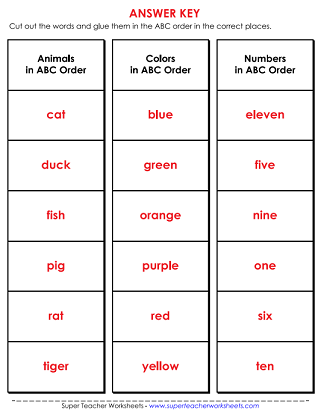 Place the eighteen word cards in alphabetical order. Learn about guide words, dictionary definitions, pronunciation keys, and other dictionary skills. 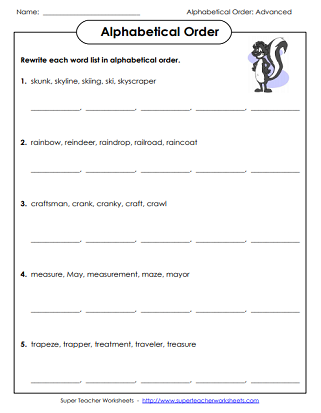 Each spelling list also includes a cut-and-glue ABC order worksheet.